First off I am going to admit I saw the $395 purchase price of the Leica adapter as purely ridiculous, then I went looking for an alternative. I found it with the Fotodiox version, but not without big shortcomings. Shortcomings that make it essentially not an option for those who care about their Leica SL bodies. The Fotodiox M-Adapter to L was priced better, even though still rather high at $125 via Amazon for what are usually $12-$25 adapters by this brand. Un-Packaging the Fotodiox Pro wasn't as special as I had anticipated. I have used their brand adapters on many occasions for other bodies and this expensive version is packaged the same way as those $12-$25 ones; I wasn't impressed. As I slid the adapter out from the plastic sleeve it came-in, laid inside the small corrugated box, I attached it to an M-Mount lens I had handy. That part was smooth enough. When moving to attaching the adapter to the body, that was not so smooth. The fitment is very tight, uncomfortably so. In fact, I took it off immediately! I then looked, and noticed nothing was awry and proceeded to install once again. It was still a tight fit but I was able to install it. My first thought was "Okay, this is going back." I headed-out the door to the Beers And Cameras meet-up that evening, and used it without much further thought. I was able to reach infinity focus, and I was able to use the SL with my M-mount glass. All was well. That is, until I had to remove it. At that point I knew there was no way I would be installing the piece on the SL again. Holiday trip to Rancho Mirage for Thanksgiving put me in the perfect position to test out the Leica version of this adapter from our friends at Camera West. The $395 Leica M-Mount to L is presented much better. Right away the silver box reminded me of other Leica products and opening the box to find a snuggly fit adapter case/bag within was another huge difference over the Fotodiox and a welcome bonus. Okay I'll admit, from the looks on this SL, they look almost identical. But they are far from it. Some technical differences below. Leica box opened on left with Fotodiox Pro on right. Build quality largely differs as well. The heavier (more on that below) Fotodiox Pro seems made out of lesser quality aluminum and more steel bits. The Leica is machined out of beautifully crafted metals and with proper high-end finish worthy of the price tag. Even the Leica logo is better inscribed on the adapter, the Fotodiox Pro will more easily rub-off with use. Also, notice the 5 screws used to mount the M-mount surface to the adapter on the Leica versus only 4 on the Fotodiox Pro. It's these small details that prevent adapters from feeling worn and loose as the years go by. Furthermore, something I didn't quite consider before purchase, the Leica has a built-in 6-Bit code reader to communicate Exif with the camera body! 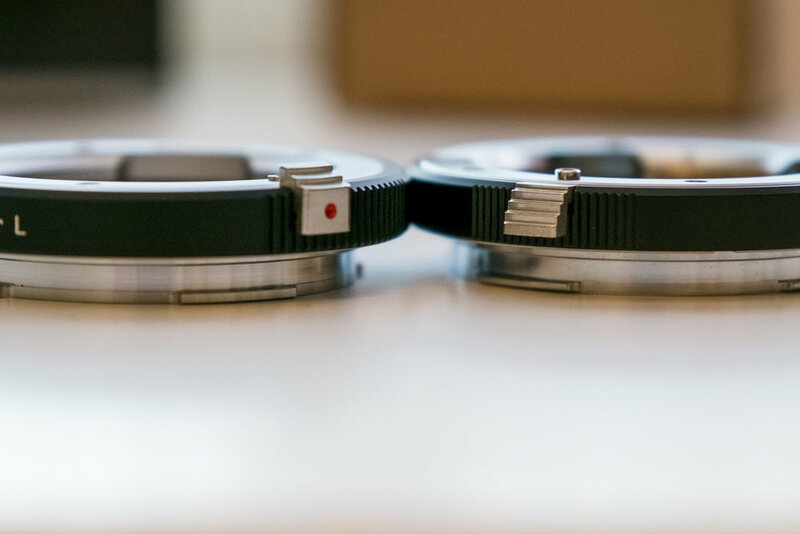 The Leica adapter also comes with M-Mount body cap and L-Mount rear cap. Right away the Leica adapter felt smoother to the touch, and the lens mounted just as easily as the Fotodiox Pro, however its when mounting it to the SL body that I was reminded right away how an adapter should feel. The adapter mounted silky smooth and without too much resistance yet still maintaining a firm, taught feel. There is no wobble with either mount when on the camera, however the Fotodiox Pro is at the expense of being extremely tight to put-on. Another clue of the nicer design and material choices of the Leica is the lighter weight even though it comes with 6-Bit coding and electrical contacts! To wrap this up. 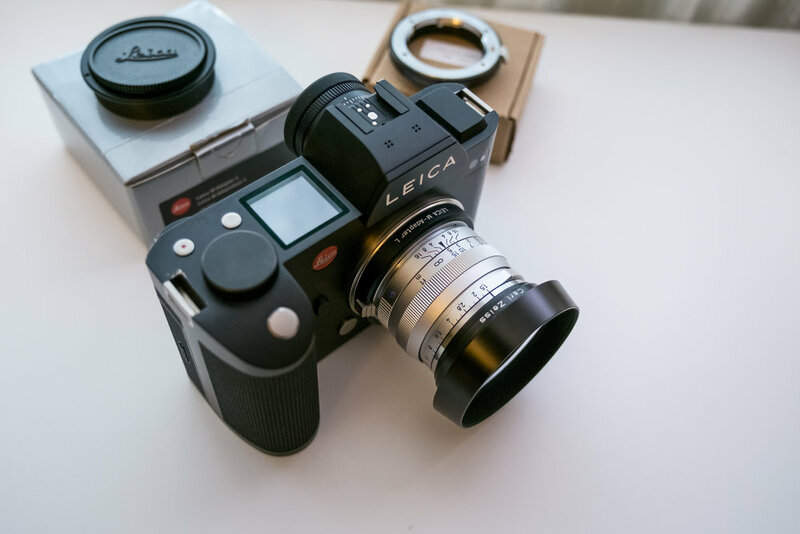 If you can't afford to pony-up the $350-$400 for the Leica M-Mount to L adapter to mount your M-mount lenses to our Leica SL, TL or CL, then I would look at the $250 Novoflex version. Still more expensive than the Fotodiox Pro (double the price) and also without the 6-Bit reading, but I would assume actually usable much like their other high quality mounts are. But ultimately if you want the best quality, you want 6-Bit reading for Exif data and you rather use nothing but Leica on your Leica camera, then the Leica M-Mount to is where its at! Shop for the Leica or Novoflex mounts by contacting Camera West or Leica Store San Francisco! I was out with the family and decided to take both our Sony A6500 and our Epson R-D1 and compare them for color using the same lens. I used the Carl Zeiss 50mm F1.5 M-Mount on both bodies. Above is the Sony A6500 with the lens at F2. Below it the Epson also at F2. In this case the Epson image was over exposed thus had to bring the exposure down to try and match the Sony. One thing right away were the green tones. The Sony had much darker green and the Epson lighter. Bokeh is generally the same, but even then not exact. There really is a relationship between lens and sensor that occurs on cameras. You can clearly see the differences with the crops. Unfortunately composition isn't 100% match as I didnt use a tripod. Next time I'll do a more in depth comparison. Cheers! A guide to Developing your own photographs with beer!